(The Telegraph): Miss Simpson, 42, from New Jersey, USA, already holds the Guinness World Record as the world’s biggest mum. She was 520lbs when she had daughter Jacqueline, three, becoming the largest woman to give birth. Now she weighs a mega 600lbs, or 43 stone, and hopes to break the 1,000lbs or half a ton mark. Miss Simpson, who wears XXXXXXXL dresses, eats whole cakes and bags of donuts and tries to move as little as possible. 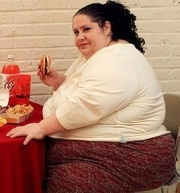 "I’d love to be 1,000lb," she said. "It might be hard though. Running after my daughter keeps my weight down." She runs her own website where people pay to watch her eat, or see her wash her huge body. Last time I checked being from "New Jersey, USA" would make her a US WOMAN…not a UK Woman…you might want to get your headlines sorted out. Either way she is sick in the head wanting to get even fatter…her poor child.